Hello! My name is Patricia (Tricia) Naessig and this is my second time working with the New England Aquarium here in the Bay of Fundy. For the last nine years, I’ve been the Wildlife Trust/EcoHealth Alliance team leader for the northern Early Warning System (EWS) right whale aerial surveys flown off the coast of Georgia in the North Atlantic right whales’ Southeastern United States calving grounds (SEUS). Northern EWS Right Whale Aerial Tracklines. The first time I came to Lubec in 2008, I trained with the Aquarium scientists for a couple weeks to learn more about their data collection techniques and to observe North Atlantic right whales on the feeding grounds. I also had a chance to meet two of the wonderful Calvineers that were also at the Lubec, Maine research house to learn more about the right whales they had been studying for all of 7th grade at the Adams School in Castine, Maine. This season, I’m here for all of August and September and very excited to be working with the research team again. One of the things I’m most excited about is the chance to see some of the whales that I’ve studied in the southeast here in the northeast after their long migration north. Nine of the 21 right whale calves born this past calving season have already been sighted in the Bay of Fundy this season! Also, there was an especially happy right whale sighting for me on August 13. After photographing a large SAG in the Bay that day, the team on the R/V Nereid spent time photographing other whales scattered around the study area. One of these whales was Catalog #3760. 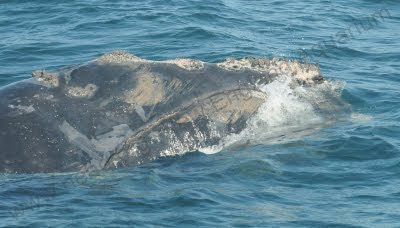 #3760 is a four year old juvenile right whale that I last saw on February 13, 2011. On that day, I was circling over the whale at 1,000 feet in a survey plane off the coast of Jekyll Island, Georgia. I was trying to photograph the whale as it rolled around in a SAG with two other whales. From the viewfinder of the camera, I could see a reddish pink color near the whale’s blowholes. While the plane continued to circle the whales, I examined the images closer on the camera and quickly realized that the whale was entangled. #3760 had pink monofilament netting coming out of the right side of its mouth and looping over its head. February 13, 2011 image of #3760 with knotted pink monofilament netting crossing over the whale's head. Photo: Georgia Department of Natural Resources, NOAA permit #9 32-1905. Once it was established that #3760 was entangled, my aerial survey team immediately called the disentanglement team based at the Georgia Department of Natural Resources (GDNR) in Brunswick, Georgia. The disentanglement team quickly pulled together all the gear they needed, jumped in their rigid-hulled inflatable boat (RHIB) and rushed out to where we were circling the whale. For the next 3.5 hours, myself and the rest of the aerial survey team helped to track the whale from the air as the disentanglement team on the water attempted to cut some of the netting on the whale. The very skilled disentanglement team was able to make multiple cuts to the monofilament netting- no easy feat! They had to get their 20 foot RHIB R/V Hurricane close enough to a free swimming large whale so a team member could reach out with a knife at the end of a long pole and cut the netting. Eventually, the plane was getting low on fuel and sunset was approaching, so the plane and the boat had to return to shore. At that point, everyone was hoping that enough cuts had been made to the whale's entanglement so the whale could eventually shed any remaining netting on its own. Clay George with the GDNR disentanglement team about to make a successful cut to the netting on the left side of #3760’s head. 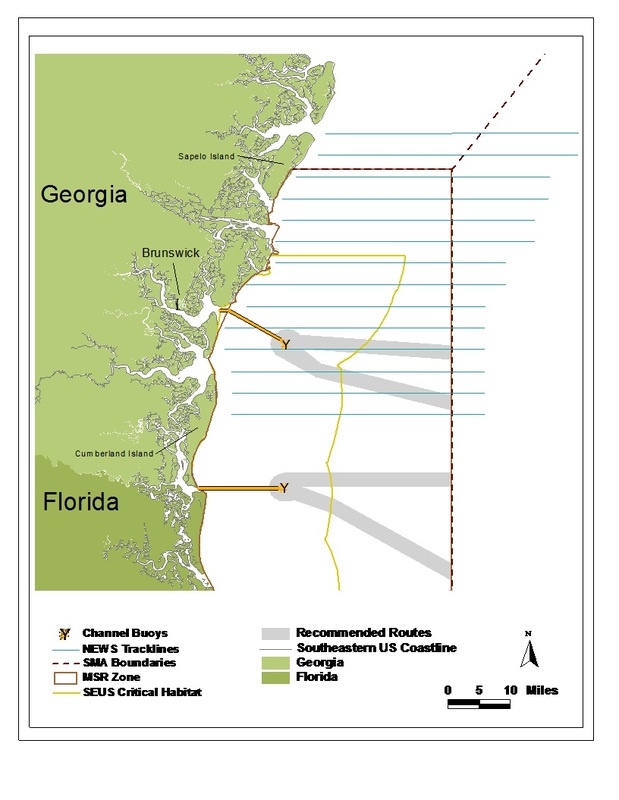 Photo Credit: Georgia Department of Natural Resources, NOAA permit #932-1905. 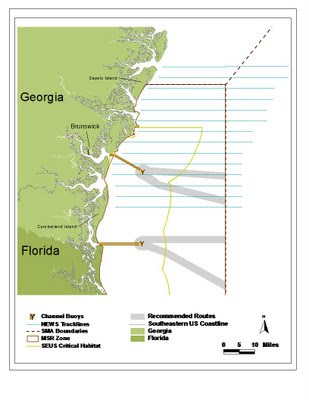 Unfortunately ,#3760 was one of five entangled right whales sighted in the SEUS during the 2010-2011 season. Not all of these entangled whales had a happy ending. After a significant disentanglement effort which included sedation (modeled on the first sedation of a right whale in 2009), #3911 (a two year old female) was found floating dead at the end of January. During most calving seasons, one or two entangled right whales are sighted during the SEUS aerial surveys. However, we’ve had five entangled right whales in the SEUS for two out of the last three seasons. Overall, over 80% of the North Atlantic right whales have scarring on their bodies indicating they were entangled at some point in their lives. It’s a frightening trend that the New England Aquarium and everyone in the right whale conservation world are working very hard to counteract.